Tickets on sale now! Sept 26, 7:30pm, Original. ALL NEW FILMS! 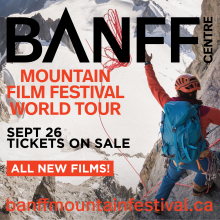 The Banff Mountain Film Festival World Tour presents over 2 1/2 hours of the most enthralling mountain adventure films that will have you planning your next adventure before the credits roll. Featuring a selection of short films from the week long Banff Mountain Film Festival in Banff, Alberta, the travelling world tour includes captivating films shot in some of the most wild and remote corners of the world. Sure to enthrall, the Banff Mountain Film Festival showcases a selection of films packed full of mesmerising cinematography, thought-provoking storylines and adrenaline-inducing action sequences. After introducing the Banff Mountain Film Festival to KW audiences over 30 years ago, we are thrilled to bring it back to the Princess once again, with many thanks from our co-presenters, MEC and Grand River Rocks.